How Effective Are Radar Speed Signs? Why Do Radar Speed Signs Work? Whether at work or at home, safety is a primary concern for our military forces. While some elements cannot be controlled, the safety on the streets of our military bases can. Radarsign’s radar speed signs are making roads safer by alerting speeding drivers and slowing them down. The most energy-efficient, traffic-calming solution in the industry, Radarsign products are manufactured in the USA and engineered to withstand the toughest environmental conditions, and are vandal resilient, bullet resistant and shock absorbent. 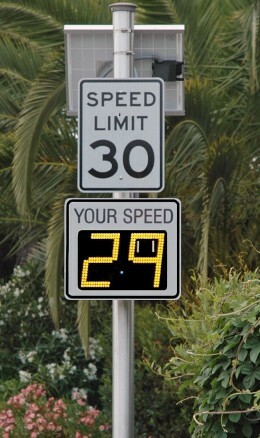 Radarsign has a variety of radar speed sign models and radar speed sign bundles to serve your traffic calming needs. 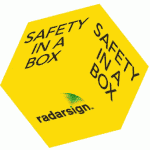 Radarsign has made implementing traffic calming systems simple with Safety in a Box™, which requires no configuration and is a complete package for the end user. This all inclusive sign package has everything needed for installation except the shovel and the concrete. All that is required is digging a hole, pouring the concrete, and installing the sign. It’s that easy. Weighing only 20 lbs, the TC-400 radar speed sign offers the ultimate in portable traffic calming. The modular design of the radar speed sign, along with the mounting technology of Radarsign’s GoBracket, make mounting and un-mounting the sign a quick, easy process. One person can easily install or relocate the TC-400 in about a minute. Field exchange of the battery packs allows multi-month usage of the sign at same location. Plus, with the GoBracket universal mount, the TC-400 can be used in hundreds of places where a speed trailer simply won’t fit – and at less than half the cost. The TC-400 will operate +/- 2 weeks on a full charge. You can easily create a circuit to rotate the sign on a regular basis. Our mobile options include the Mobile Patrol Stand and the Radar on the Go speed trailer hitch. Wherever your traffic calming need, Radarsign has a solution where you need it, when you need it. Radarsign has a variety of radar speed sign models and radar speed sign bundles to choose from. Compare our models and see which one is the best traffic calming solution for you. ©2019 Radarsign – Radar Speed SignsAll rights reserved.